Have you ever walked into a place and known that you belong? Many people have said that is how they feel about Sunrise Community Church. In the 1970’s Dr. Raymond C. Ortlund, pastor of Lake Avenue Church, had a vision to plant several daughter churches in the San Gabriel Valley. Of all the churches that were planted, Sunrise Community Church was the only one which has survived the last 35 years. Sunrise began without a name, referred to by those who attended as “The Little Church on the 3rd Floor” because it met on the 3rd floor of Hutchins Hall of Lake Avenue Congregational Church. After that, it was passed from house to house, much like the early church, meeting in people’s homes and other properties. Sometimes it met in a backyard, and sometimes it met in another church building- wherever a fellowship could be gathered. During this time, Bob Ver Burg was called by the congregation to lead them as pastor. After a few years, Sunrise (now named Sunrise Community Church) found a home at the Westminster Presbyterian Church in Temple City. It has stayed there ever since. Pastor Bob Ver Burg and his wife Patti led the little church from 1975-1996. In this time many, many people came through Sunrise and left not because they were dissatisfied, but because they used the church as a launching pad for their own ministries. Sunrise has touched several hundred lives over the years, many of whom have gone on to form churches, lead ministries and be influential people in all corners of the globe in service of the Lord. Missionaries that the church has faithfully supported have grown, married, had families (who are following in their parent’s footsteps) and continue to impact the world for Jesus Christ. Pastor Ver Burg took a small church with no name or home and built a church community with a home in Temple City. In 1996 after twenty-one years of faithful and humble service, Bob and Patti Ver Burg left the church and became teachers in the El Monte City School District. After a long search, Sunrise called Bryan Griem to pastor the church. During his service, Sunrise conducted Christmas Eve and sunrise Easter services in Temple City Park to minister to the local community. After two years of service, Pastor Griem moved on to other ministries and Sunrise was again without a pastor. During this time, a search was conducted for a new pastor to shepherd the congregation. While the search was being conducted, Andrew Kikkert, who had grown up and gotten married at Sunrise, started preaching as an Elder in the church. The search committee liked what they heard and in 2001 made him Pastor Andrew Kikkert. Andrew and his wife Wendy have led the church ever since, allowing it to grow, bringing stability and teaching the word of God to people who are hungry for it. While many of those who originally had the vision to establish Sunrise Community Church have moved on to other ministries or home to be with the Lord, Sunrise continues to minister to and impact the world as they seek to fulfill their mission statement to worship God, equip the saints and proclaim the gospel of Jesus Christ. 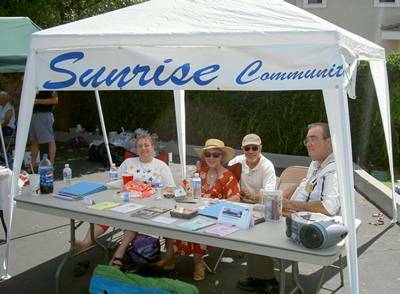 Over the years, Sunrise has held its own special Olympics, playgroups, weddings, funerals, picnics at Live Oak Park, Creative Arts Workshop for kids, numerous skits, a musical, potlucks galore, free babysitting for young couples, Game Nights, fellowship nights, men’s breakfasts, women’s teas and church camping trips. People of all ages and backgrounds have attended and found Sunrise a place they could call home. Sunrise currently offers a Sunday morning service at 8:45am, Sunday School classes for children, youth and adults at 10:30am, monthly community prayer, Game Nights on the first and third Fridays nights and Friday Night Fellowship with dinner, singing and teaching on the second and fourth Fridays nights, as well as Bible studies during the week. We invite you to join us as we seek to worship God, equip the saints and proclaim the gospel of Jesus Christ to our community and the world!